Like many of you who have Nexus devices, I have spent this past week putting the release build of Android Marshmallow through its paces. As I noted in my review of Android Marshmallow, I’ve had it up and running on one of my Nexus 6 for the past few weeks with the Preview 3 and now running it on my daily driver Nexus 6 and my Nexus 7 tablet. 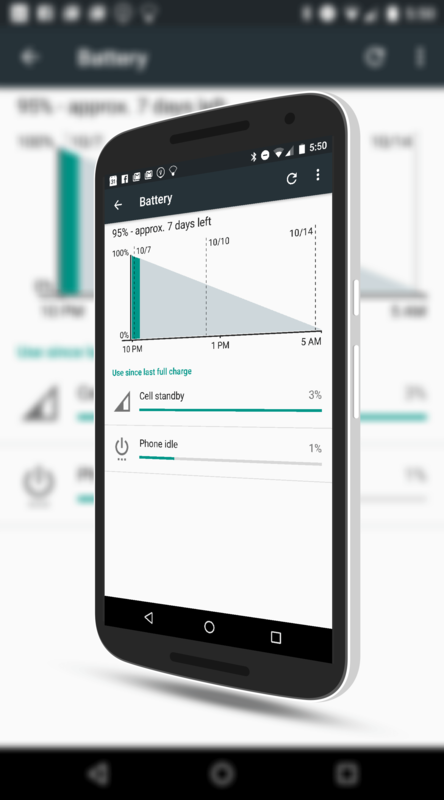 One of the key features that I mentioned in my review was Doze and App Standby. In Android Marshmallow, when your device is sitting idle, the OS will shut down apps to a very lower power state but will stay alive enough for you to get updates and notifications. When you pick your device back up, everything comes back to life as normal and you won’t have any lag or delay when you open up an app. This is the Doze part of the equation. What makes this really impressive is Marshmallow learns your habits and the apps that you use most and which ones you don’t so much. On these apps it dramatically restricts the amount of power used by the apps for maximum battery efficiency. This is the App Standby functionality. I have spent the last couple of nights testing the Doze functionality and the results are dramatic. This could well prove to be the killer feature of the release and based on what others are reporting, I’m not along in the battery savings I’m seeing on my devices. charging it to 100% and then unplugging it over night. That unplug happened at 9:30PM and when I got back to the device at around 6:30AM on Tuesday, the battery had dropped a total of 2%. I repeated the same type of test on the Nexus 6, charging it to 100% on Tuesday night, unplugging it around 9:30PM and returning to it on Wednesday morning at 5:05AM. In this test the battery had dropped at total of 5%. The drop on the Nexus 6 was more but it also has a cellular antenna in it where as my Nexus 7 is a Wi-Fi only unit. For comparison, I did the exact same test on my OnePlus One and Samsung Galaxy Tab 4, both of which are running Android Lollipop. In the case of the Galaxy Tab 4, the battery dropped on this overnight by 12%, 10% more than my Nexus 7 on Marshmallow. It too is a Wi-Fi only model. On the OnePlus One, the drop was 14%, 9% more than that of the Nexus 6 running Marshmallow. By no means am I suggesting my results are scientific fact but equally it seems pretty clear that there is significant battery savings happening in Android Marshmallow. There are a lot of reasons to upgrade to Android Marshmallow it is available for your device and Doze should be near the top of that list. All indications are that this new software enhancement to save on battery power not only works but works exceptionally well. It doesn’t solve the underlying challenge of battery consumption by mobile devices but it goes a long way in helping resolve it. It also shows that while battery technology can and continues to improve, software will play an equally important role in battery longevity for users.